Perfect holiday gift choice for Birthday, Anniversary, Wedding, Thanksgiving day, Christmas etc. 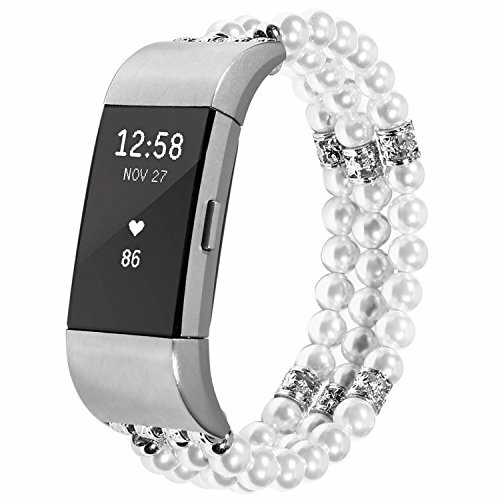 Stainless steel for the connector part, Faux Pearl crystal beads, Durable elastic rope,Smoothy Beads.This listing is for the replacement strap only, Fitbit watch is not included. the recommended wrist size is between 5.7 inches to 6.9 inches; if you have a bigger wrist or smaller wrist, maybe the elastic cords will work tighter or looser..
We commit to give all customers an excellent shopping experience, if you have any questions or problems, please feel free to contact us.